Box Cake Made Vegan/Gluten Free < Yes Yes Yes. 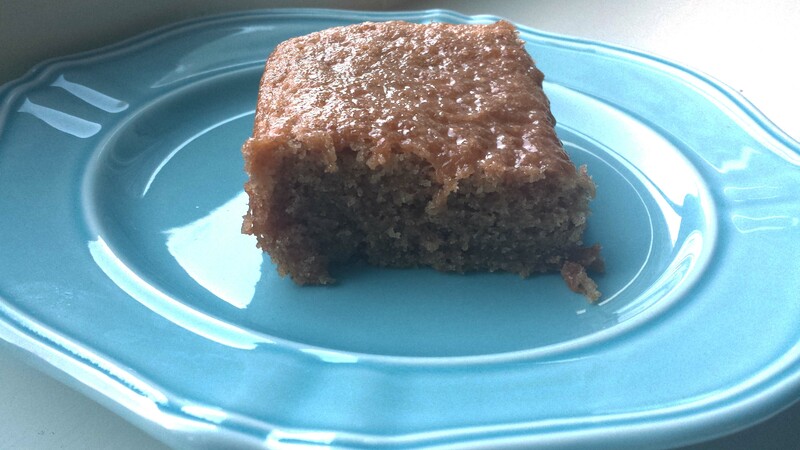 Cinnamon Cake – King Arthur GF Box Cake Made Vegan < Yes Yes Yes. This Summer we were invited to a pot luck and asked to bring “A Dessert”. This terrified me. I wanted to bring something that I could eat (dairy free / gluten free) – but that everyone else would like as well. I was also majorly short on time. I was walking through the grocery store and this little gem stood out at me. 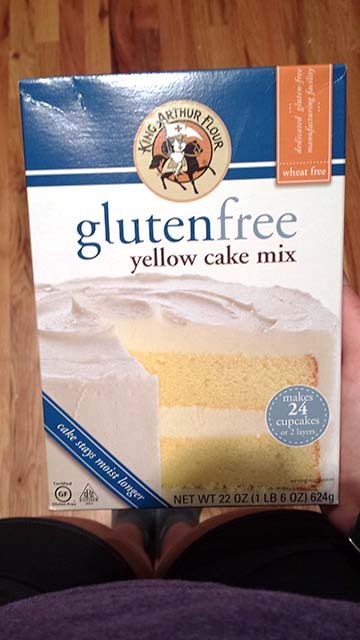 King Arthur Yellow Cake Mix . I decided I may as well give it a shot. Everyone likes cake, right?! (well, in our family we do..at least!). The next thing I had to decide is how to substitute for all of the normal instructions on the back of the box. I kept the ingredients pretty true-to-form as far as amount, but I made substitutions to make the cake dairy and egg free. (I did a new combo for the eggs – you’ll see it below – I can’t wait to try it in more things!) If you eat dairy and eggs, you can feel free to make the cake as-box-described. No one should be without cake. Preheat the oven to 350 degrees. 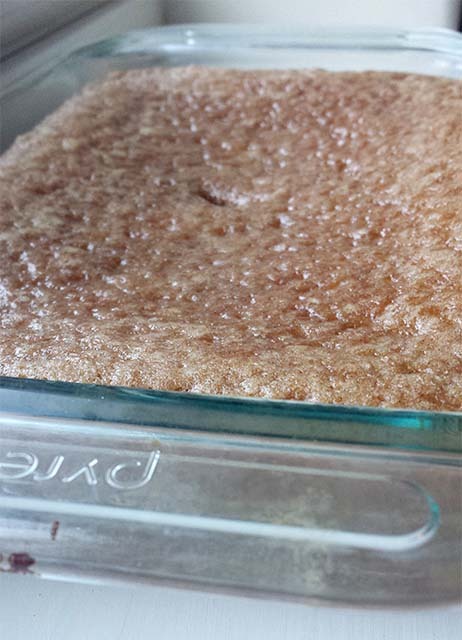 Grease the bottom (just the bottom) of a cake pan – I used a 7 X 9 pan – but you can use any similar size (or the size described on your cake box). Using an electric mixer beat the butter substitute, first 2 tablespoons coconut oil, vanilla extract and cinnamon until well mixed. Then, add half of the cake mix, mixing well. Turn on the lowest speed of the mixer and add ½ of the flax egg mixture. Mix well. Add the other half of the flax egg, and mix well again. Repeat this step for the coconut oil – mixing ½ at a time. Now you’ll have the butter, coconut oil, vanilla, cinnamon, ½ of the cake mix, flax eggs and coconut oil eggs mixed together. Add 1/3 of the milk at a time, alternating with 1/3 of the remaining cake mix, until both are all added. Mix until just combined – scraping the sides as necessary. Mix until just combined. 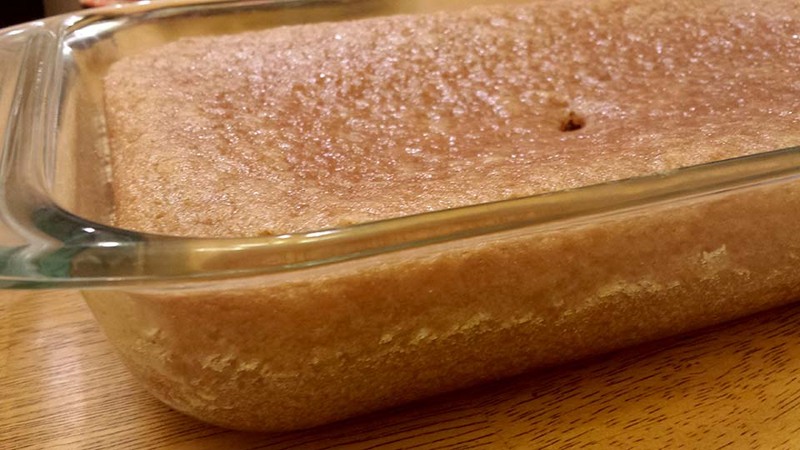 Bake for 35 – 45 minutes, until firm on top when pressed. Remove the cake from the oven and allow to cool completely. Eat with love. If not going to eat in the next 24 hours, refrigerate to keep it fresher. You can certainly add icing to this cake - it's delicious on its own, though! Ummm… This cake is delicious. Chelsea is a rock star in the kitchen!!! !